With all kinds of vehicle there are compromises to be made. Large, heavy cars are often unwieldy and cumbersome through corners, coupes don’t have much headroom in the back, and powerful vehicles aren’t often very efficient. Something manufacturers try hard to maximise is load space – there’s little point in having a car with no room for the shopping. Unfortunately, though, it’s not always possible to provide masses of load space in a car with miniscule exterior dimensions, nor can you fill the boot with shopping if half of it is reserved for stowing the roof, as is the case with many cabriolets. We’ve gathered together the data and found the cars on sale with the tiniest boots. For this list we’ve taken the minimum load space figure, which is the total amount of space when the rear seats aren’t folded flat. All of the models featured are current, and we’ve omitted seven seaters because most of the time one or both of the rear-most seats will be stowed. Kicking off the list is the Chevrolet Spark, with 170-litres of boot space. It’s not what you’d call spacious, but when you compare the practicality of the Spark with other cars in this list, many of which are direct competitors, it’s not too bad, not least because it has five-doors and many rivals only have three. It’s fair to say it’ll be a struggle to take the Spark on a two-week cross-European tour with four passengers, but that’s not what it’s for. It looks a bit like an Evo X that shrank in the wash, and if you buy a Ralliart version it behaves like one too. But, alas, it’s not at its best when it comes to boot space. 160 litres isn’t too bad in this class, as you’ll see from the rest of this list, but nor is it particularly great – compare it to the cheaper Hyundai i10, which has a 225-litre capacity, and you’ll appreciate the difference. The MINI hatch is extremely popular thanks to its exciting handling, classless image and high quality build. The range is so huge now that you can get everything from a simple, entry level ‘First’ at £11,810 to a Rolls-Royce inspired model at a staggering £41,000. Sadly, they all share a common problem – they’re not very spacious. The front seats are fine but the rear seats are cramped, and the boot is a measly 160-litres, the same as the Colt above. Everything about the Corvette is big. It’s got eight cylinders displacing 6.2-litres, costs £56,186 and is very, very wide. It’s a shame that the boot misses out, though - it’s a tiny 144-litres. But if you’re going to buy a drop-top Corvette then the chances are that it’ll be for occasional use, thanks to high fuel costs. The Wrangler is a bit of a curio. It looks like a modern version of the original GP military vehicle, particularly in its two-door form. Perhaps because it stays quite true to the dimensions of its ancestors it doesn’t have a very big boot – 142 litres to be precise. There is, of course, a four-door version with more room. Much like the Corvette, though, the Wrangler appeals to a certain kind of person who’ll likely care little for its practicalities and more for its image. Three cars, all with the same sized boot? It’s not as strange as it looks. These three have been grouped together because fundamentally, beneath all of the garnish, they are all the same - they even come from the same factory. In car years they’re getting on a bit now, too. They went on sale in 2005 and since then many competitors have managed to improve interior packaging to create a bigger load space without compromising the exterior dimensions too much. Another pair of twins. The Alto and Pixo are built on the same platform and as such share the same boot space, a fairly unimpressive 129 litres. Still, the Pixo is really, really cheap and the Alto is very cute, so a lot of buyers will overlook the small boot when it comes to buying, and for the purposes of driving a few miles to the supermarket once a week it’ll do the job nicely. Anyone who buys a fabric topped cabriolet is likely aware of the compromises. Security is reduced because anyone can cut their way in, refinement is reduced because of the lack of sound proofing provided by the fabric, and boot space is reduced because the rear of the car must be restyled for various reasons, not least to accommodate the folded roof. This is the case with the MINI Convertible, too, but unfortunately there wasn’t much boot space available to start with. But it’s a price many will gladly pay for wind-in-the-hair summer drives. Necessity is the mother of all invention, so the saying goes, and so we have the Suzuki Jimny. In Japan there is a reduced tax rate for cars below a certain size and engine capacity. These miniature vehicles are called keijidōsha in Japan, and some are exported - the Jimny is one such vehicle. UK versions get a larger engine than the Japanese models, but besides that it’s very similar. Unfortunately, in order to cram four seats and a boot into such a small space, the load space is pretty tiny at 113 litres. 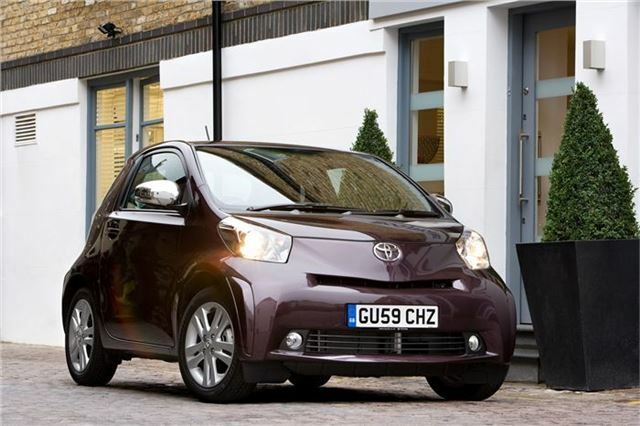 The Toyota iQ is an extremely clever design. Its dimensions are similar to those of the smart fortwo, but while that has two seats the iQ has four. Obviously this has an impact on the amount of boot space, but there are spaces elsewhere to store bits and pieces in the cabin and, like many cars in this list, you can fold the seats down. So even though it’s the ‘worst’ car of these ten, it’s hardly fair to call it bad – as far as interior packaging is concerned it’s probably the best of them all. For a Data Bank top ten of the most spacious cars on sale, click here.